colour images. The opening chapters provide broad introductions to the principal geologic and climatic conditions governing land forming processes; the factors influencing the diversity of a wide variety of organisms both on the land and in aquatic environments; as well as features of the multiple Aboriginal clans that have lived in the region and subsequent visitors including European explorers, Macassans, pearlers, missionaries and European land settlers. The eight chapters that follow have interesting descriptions of over sixty sites Sandy has visited during his multiple annual visits over the past twenty years between the Lacepede Islands and the Berkeley River. 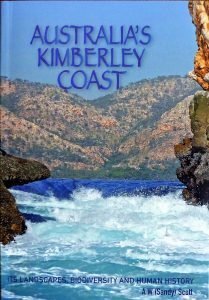 This is an informative reference book on the little-known coastline of north western Australia that reflects the pristine charm and makeup of its diverse landforms and biota; explains some of the features of the main indigenous coastal clans; and relates stories of past foreign visitors to the coast.